In February when my friend Jenn and I went to visit my sister-in-law Laura in Scotland, we were in this pub (I think in Edinburgh?) and Jenn ordered something that came with something like what we've tried to duplicate here. Okay, I know that sounds a bit vague. Have pity on my pregnant mind and the way it works. 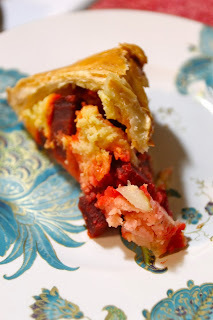 What happened is this: I woke up last week and wanted to put beets in puff pastry and thought I remembered that it should also contain potatoes. Carbs with carbs and a little veg? Heck to the yes please! So I called Jenn and convinced her to come over and help me with this and then we ate it. This was actually really yummy, and if you want you can totally add some cheese into it. Just in case there aren't enough carbs in it for you and you want to add a little fatty fat to it. I love it. Jenn and I liked it so much that she started work on another incarnation of this same recipe....so it's possible you may get some variations on this theme on here in the near future. Anything is possible. Now for this recipe I use my beets that we steamed and froze in season. They are awesome because you just take them out of the freezer, thaw or microwave and cook with them as you please. You can also use fresh beets, which will add a bit to prep time, but it'll be totally worth it. Also? I have a sort of obsession with putting things in puff pastry....like this torta which is another way I like to cook potatoes in puff pastry! To cook potatoes swiftly and without fuss, wrap the peeled spuds in a wet paper towel and microwave them for 10-12 minutes or until they are soft. I learned this trick from Jenn, and trust me, it totally works and is awesome! When the potatoes are soft, throw them in a bowl with the butter and milk. Mash them up. I like to use my old fashioned potato masher, but hey, whatever floats your boat. In a separate bowl, beat one of your eggs. Add it to your mashed potatoes along with your beets, cayenne, garlic, salt and pepper. Stir it all up. Grease your springform pan with a bit of butter. Drape your thawed puff pastry over your springform pan. Place your potato/beet mixture into the puff pastry and drape the top of the puff over the mixture to fully cover. In a small bowl, beat your other egg. Using a brush, brush your puff pastry with the egg, and then place the whole thing in the preheated oven. Allow it to bake for 45 minutes or until it's all puffy and awesome. Enjoy with a good friend and maybe a salad!